Payment sent! This is going to be awesome. Thanks. 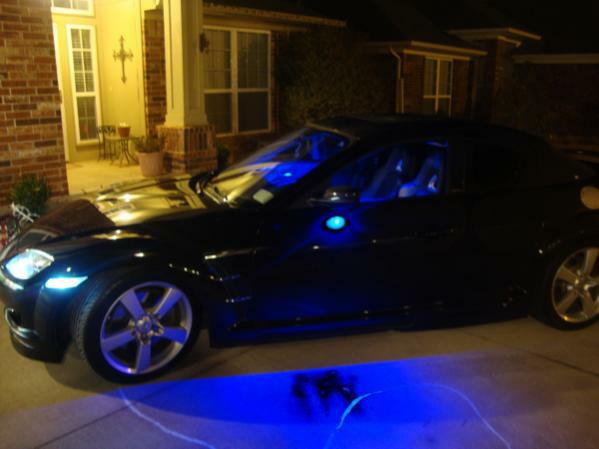 Placed my order for blue LEDs. Can't wait to get them. I'm trying to find a vendor within today or tomorrow to order LEDs. Currently out of red and white. Blue I have plenty of. Amber, I keep a low supply as not many people order amber puddle lights. I'll update you today if I can secure a LED vendor. wooo hooo !!! I'm good to go with blue! got my puddle lights in today... THEY ARE AMAZING!!! Got mine in today, will try to install on Saturday and get some pictures. Thanks Shaz! Put mine in today. Took a lot longer than I expected, but I haven't slept in 30 something hours, so that didn't help. Anyways, I appreciate the fast shipping and they are great! Instructions didn't miss anything! I'm not tracking what you are talking about? The wire from the lights that goes between the painted portion of the mirror and the rest of it? Or in the door? There's a spot where the heated mirror wires tuck into. You can bundle/zip tie the extra cabling and then tuck it in there. Or the other way is to stuff them however they are and just close the side mirror cover. Alex, he's asking about the extra light housing wire that is behind the mirror before it routes into the hole to the door.. It's only exposed if you don't have your mirror covers on. Got mine installed! And then my camera died, so no pics yet. 1) Step 8 - Disconnecting the speaker. I couldn't get mine disconnected (both sides). Instead, I realize you can just put it on top of the door frame hanging. The magnet in the speaker would prevent too much stress on the wire. 2) Step 14 - Disconnecting connectors to the window controls etc - The driver side was impossible for me to pull off. You can unscrew the 3 screws that hold the window controls + door lock button assembly. It'll fit through the big hole left by the panel. 3) Step 16 - One or two clips are bound to break. I'll attribute it to the fact that the clips on my doors are old (06). Most of them remain, and the door panel will hold with the remainder. In fact, it'll help taking off the door panel next time. 4) Step 36 - In installing the wire connectors, I found out two things. First, I'm used to splicing wires by cutting them and soldering them together. I did not notice your connectors at first, so I cut one of mine. If anyone else did that too, don't be worried. You can easily strip the ends and tie into the wire connectors provided. Also, I would HIGHLY suggest using a knife or some tool to remove some of the insulation so the metal piece in the connector can actually make contact. Shaz, can you clarify if this is a good or bad idea? I realize the connector was unable to penetrate the insulation on both the stock wire and the wires you provided. Since the wires are practically sealed in the connector (via pressure), I wouldn't worry about corrosion. That's about all I figured would be helpful as additional information. Oh, one more piece of advice: Double check every step before you continue. I actually routed the wires in my driver side in the mirror through the slot where the mirror cover clips into, and found that out AFTER I reassembled everything. Thankfully, the clip still fits and holds the mirror in. What do you mean on this? The tap splice clips penetrate the wires fine. I've noticed though, you need to use pliers to push the metal part down and then close the lock on the connector. Ya, the wire taps work perfectly fine. Gotcha, thanks. Yes, that was what I meant, and I did not realize to use a plier. My buddy said that they arrived the other day at his place. Im looking forward to installing them when Im home from Iraq! Thanks! Here is a quick pic of what they look like on a BB with blue interiors and blue puddles at night... super long description and set up huh!?!? Ignore my sig below as I thought it would be cool to screw with the colors and whatnot. can't really see the detail in the sig , but the first pic looks pretty good. I'm just waiting on my small batch of LED lights order to arrive. It should be sometime this week. As soon as I get those, I'll ship out your puddle lights and let you know. I ordered some different LEDs too so I can compare with the current light output. I'll let you guys know what I find when they arrive.